Bermuda Limousine of New York City prepared for the high demand of chauffeured Limousines, SUV’s, and Sedans for upcoming Super Bowl XLVIII in New Jersey. November 17th, 2013, Bermuda Limousine International has announced to clients and heads of host committees in NYC that they are prepared for the high demand of Chauffeured transportation Services during Super Bowl XLVIII week at the MetLife Stadium. Super Bowl XLVIII will be the 48th edition of the Super Bowl in American football, and the 44th annual championship game of the modern-era National Football League (NFL). It is scheduled to be held on February 2, 2014 at MetLife Stadium at the Meadowlands Sports Complex in East Rutherford, New Jersey, to determine the champion for the 2013 season. This would be the first Super Bowl to be played outdoors in a cold weather environment, the first in 38 years to be played outdoors on artificial turf and the first in which two US states (New York and New Jersey) will work together with hosting duties. It will also be the first Super Bowl in NFL history to have two host teams (the New York Giants and New York Jets) as both play in the same stadium. It will also be the first Super Bowl played on February 2 since the game was permanently moved to the month of February in 2004. The new stadium has seating for 82,566 fans, including 10,005 club seats and approximately 218 luxury suites, making it the largest NFL stadium in total seating. Corporate Transportation demand to the event is expecting to reach record levels. This type of demand immediately affects availability on vehicles and chauffeurs. 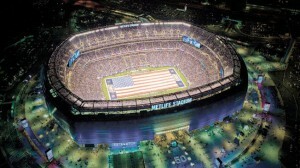 RESERVE FOR SUPER BOWL 2014 NOW!!! Bermuda Limousine has been operating since 1941 and has been directly involved in accommodating large groups at major events throughout NYC, Washington D.C. , NJ, Connecticut, and Massachusetts. As logistics experts we are continually increasing our fleet and hiring experienced chauffeurs to accommodate our growth. Recently awarded “Fleet Safety Award”, by Lancer Insurance, our fleet consist of the finest vehicles for passenger transportation. We currently offer Lincoln MKT Town Cars, Lincoln MKT Limousine, Lincoln Navigators, Cadillac Escalades, Mercedes S-Class S550, Mercedes Luxury Sprinter, Ford Club Vans, Ford Luxury Vans, Mini Motor Coach, and Wheelchair Accessible Luxury Mini Van.